Even if you don't know what "salmonella" is, if you cook chicken, you're watching out for it. 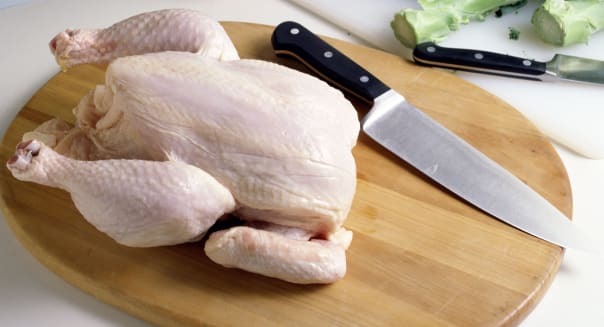 It's the bacteria most commonly associated with food poisoning from poultry -- which makes it a big part of the reason home cooks are cautioned to disinfect surfaces, prepare and serve food on different plates, and make sure that chicken is cooked all the way through. Recently, those standard warnings have gained fresh relevance as a new outbreak of especially virulent salmonella has been reported in the U.S. food supply. In other words, if you like to eat chicken, this might be a good time to reconsider what kind you buy, where you buy it from, and how you prepare it. Given how much effort we go through to avoid it, the actual danger presented by traditional salmonella is surprisingly small. The nasty little bacteria causes an estimated 80 deaths per year in the U.S., largely among people who are already immune-compromised. And, while salmonella causes thousands of food poisoning cases each year, the majority are minor: Only about 20 percent of victims require a hospital visit. %VIRTUAL-article-sponsoredlinks%But the new outbreak, which has been given the name salmonella Heidelberg, is especially virulent. Of the 338 reported cases, 42 percent have required hospitalization, more than twice the usual level. And 15 percent of victims have developed blood infections, compared with a usual rate of around 5 percent. To make things worse, several strains of salmonella Heidelberg are antibiotic-resistant, which complicates treatment. The recent budget madness in Washington has been another factor helping Heidelberg along. Normally, the Centers for Disease Control often uses PulseNet, a network of laboratories, to track outbreaks like this one. Unfortunately, PulseNet was closed for two weeks on October, shut down along with the rest of the government's "non-essential" services. Complicating matters further is that, while the infected poultry was largely produced by California-based Foster Farms, a chicken processing company, it has been sold under a variety of names and in a variety of forms. Costco, for example, has recalled thousands of pounds of rotisserie chicken, rotisserie chicken parts, chicken soups, wings, and other products -- many of which were sold under its in-house Kirkland brand. Kroger (KR) has also had massive recalls. So what can you do? This would be a good time to pick a different entree, especially if you live in California, where most of the cases have been reported. If you can't bear to take the versatile birds out of your diet, you might want to shift to organic or free-range chickens. Or, at a minimum, stay away from rotisserie chicken until the CDC informs us that this outbreak has passed. In a broader sense, though, this might be a good incentive to examine where your chicken comes from. After all, this is only the latest in a series of poultry problems, and more are on the horizon. Between chickens from China, cutbacks in USDA inspections, recent revelations about the unappetizing ingredients in chicken nuggets, and the discovery of arsenic in our chicken, there are plenty of reasons to give factory-raised birds the boot.